Robert Benchley? Arthur Loeb Mayer? Apocryphal? Benchley died in 1945; hence, this scenario appears anachronistic. Would you please help determine what Benchley said? Quote Investigator: QI has found no evidence that Robert Benchley made a comical remark about jogging. Instead, QI conjectures that the quip was derived from an anecdote published in 1952 which is listed further below. Next month will be a bad one for those people who bruise easily, as meteor showers are predicted. It will be well for everyone to travel by subway as much as possible, or, at any rate, to hug up close to the buildings while walking along the street. Those meteors can hurt! To forestall indignant letters from astronomers and ex-meteors let me say that I know the difference between meteors and meteorites, and that meteorites are the only one that could hurt if they hit you. Dear Quote Investigator: The Broadway play “Abie’s Irish Rose” opened in 1922 and ran for more than five years which was a record-breaking achievement at the time. The writer and future actor Robert Benchley was the drama critic at “Life” magazine, and apparently he detested the production. Every week he crafted a new insult and printed it in the play guide that appeared in the periodical. Would you please list some of these barbs? Abie’s Irish Rose. Republic.—Something awful. Abie’s Irish Rose. Republic—Couldn’t be much worse. Abie’s Irish Rose. Republic.—People laugh at this every night, which explains why a democracy can never be a success. Robert Benchley? Mark Twain? Walter Winchell? Groucho Marx? Anonymous? After writing for fifteen years it struck me I had no talent for writing. I couldn’t give it up. By that time I was already famous! Was this quip created by Robert Benchley, Mark Twain, or somebody else? SCRIBBLER.—It took me nearly ten years to learn that I couldn’t write poetry. FRIEND.—Gave it up then, did you? SCRIBBLER.—Oh, no. By that time I had a reputation. 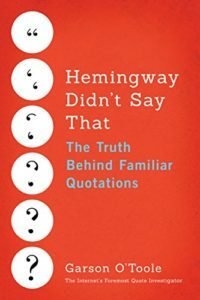 The quip was retold, and the phrasing evolved for decades, but the creator was left unnamed. The earliest connection to Mark Twain located by QI appeared in the popular newspaper column of Walter Winchell in 1946. The first known attachment of the joke to Benchley occurred in an issue of Reader’s Digest in 1949. Also, Nathaniel Benchley, the son of Robert, attributed the joke to his father in a biography he wrote in 1955. The details are provided further below.